This KM 70/20 C is an entry level pedestrian controlled push sweeper with side brush that sweeps 7 x faster than a conventional brush. The main feature of this sweeper is the adjustable roller brush that you can change the height of in seconds to suit the surface being cleaned. 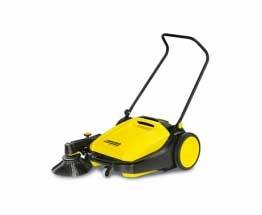 Ideal for cleaning paths, halls and warehouses quickly and efficiently.